A while back, I gave you my honest review of the Thrive Architect plugin for WordPress. In this post, I’m going to talk about, and review, an awesome little add-on for the Thrive Architect plugin called, Thrive Optimize. Thrive Architect has become one of my favorite go-to tools for building rock-solid landing pages in WordPress. One of the many reasons why I love this plugin so much is because I don’t have to mess around with silly bits of code, for the most part. I mean, don’t get me wrong – Generally, I like playing around with silly bits of code, however, Thrive Architect saves me a tremendous amount of time. 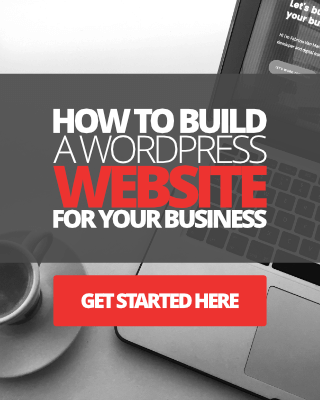 If you don’t already know, Thrive Architect is an all-singing, all-dancing, complete point, click, drag-and-drop website page building plugin for WordPress. It comes with a ton of built-in features, options, design elements, reporting tools, etc. With Thrive Architect, you can create any type of landing page for your website, from custom home pages to sales pages, lead generation pages, online course content pages, membership area pages, and more. However, despite being such a very powerful and feature packed marketing tool for WordPress, Thrive Architect felt somewhat incomplete. Until now that is! Thrive Optimize is an add-on plugin or extension that works with Thrive Architect. This little add-on plugin is a fully fledged A/B split-testing tool for landing pages designed and deployed using the Thrive Architect plugin. 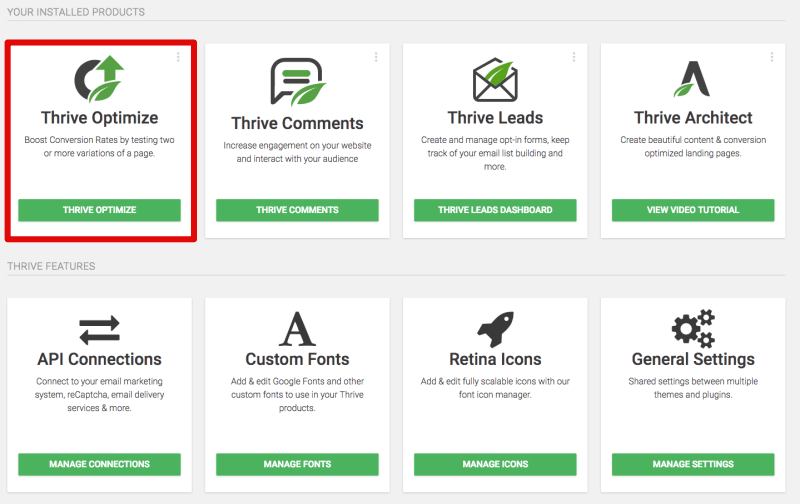 While being simple enough, Thrive Optimize combined with the Architect plugin, makes for a very powerful conversion design and optimization tool indeed. 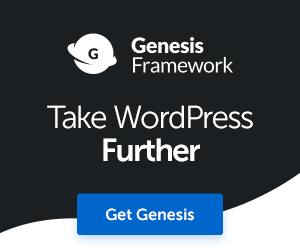 A possible a game changer for online businesses using WordPress? I mean, doing A/B split testing for your landing pages right inside your WordPress dashboard? That’s insanely awesome, don’t you think? Over the last 5 weeks or so, I’ve been putting the Thrive Optimize plugin to the test on my Video Course Email Sign-up Landing Page. Here’s what I got from testing my original lead generation landing page with a new variation. With Thrive Optimize, I was able to design a new variation landing page based on the original. I then changed the background color, headline title description, CTA button color and action words, I also added some bullet-points to the variation page. I then tested this variation page against the original lead generation page. I wanted to check if the new design would convert better than the original, and 5 weeks later, what I actually found was completely the opposite. The rate of conversion was better with my original page design. So, while I was all excited about redesigning my email landing page and deploying it immediately for my visitors to see, by testing it against my original page, I could see that using the new design was actually going to affect my conversions. In this case, I simply stuck with my original landing page design. Admittedly though, the variation landing page had 20% fewer visits, that’s because I adjusted the percentage of traffic to each landing page towards the end of the test. So, this could have also affected the conversion rate. Now, of course, I will create a new variation lead generation landing page design and test it against the original again, until I find a design that converts better. I’ll even update this post when I do! And the most amazing thing is, I’m doing all of this on the back-end of my WordPress website, that’s the real beauty of this plugin. Asides letting the test run and waiting for the results, it’s simple and quick to set up. “Well, Fabrizio, why don’t you just use something like Crazy Egg or HotJar to do A/B split testing for your landing pages?”. I could quite easily do that, however, using a third party website or service, that costs time to set up, money, and not to mention the hassle of going back and forth from one site to another to check the results, make changes, refresh the test, and everything else. Also, with Thrive Optimize, there’s no need for me to add any additional tracking scripts to my website or landing pages. So, for me, using Thrive Architect with Thrive Optimize makes perfect sense. Everything happens in one domain – my website, and I can quickly make simple changes and let the test run its course. And, for the record, I do use CrazyEgg from time to time because I love that tool too. OK, so here is a quick list of the benefits of using Thrive Optimize with Thrive Architect for your online business. What are the features of Thrive Optimize? Zero integrations to boggle your mind and website with. Cost-effective when you consider the price of this plugin with a monthly subscription to a site like CrazyEgg or HotJar. OK, so now let’s look at what you actually get in terms of features. And please remember, this plugin will not work without Thrive Architect. 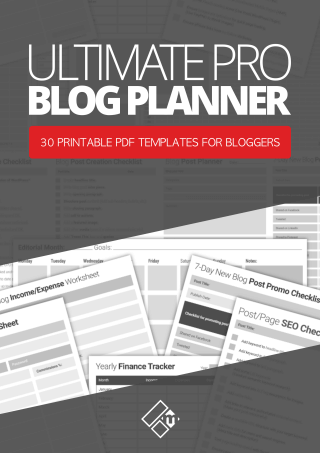 You must have this plugin on your site for Optimize to work. Create multiple and unlimited variations of your landing pages. Add notes to your variations for future reference. 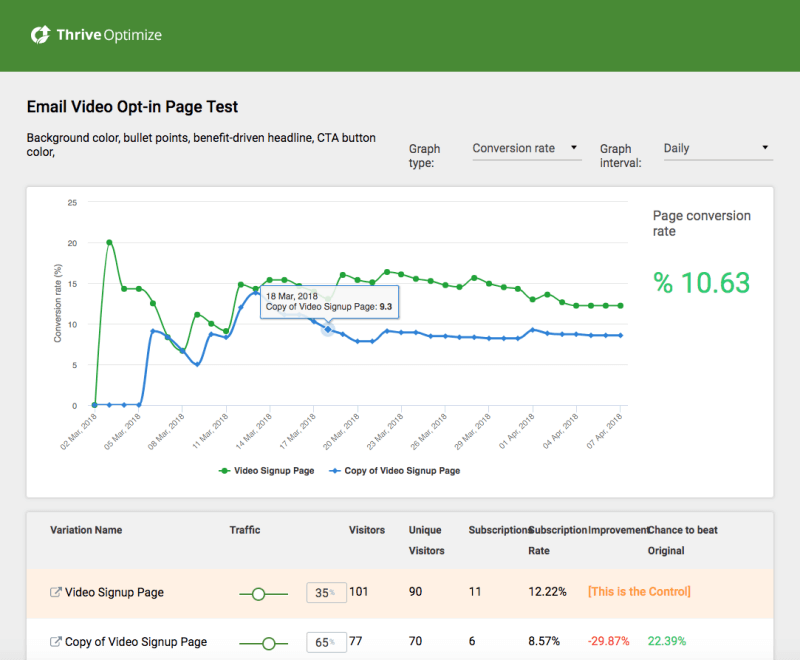 Get detailed reports on your variation page performance, conversion rate, etc. Ability to control how much traffic to allow for each variation of your landing page during testing. 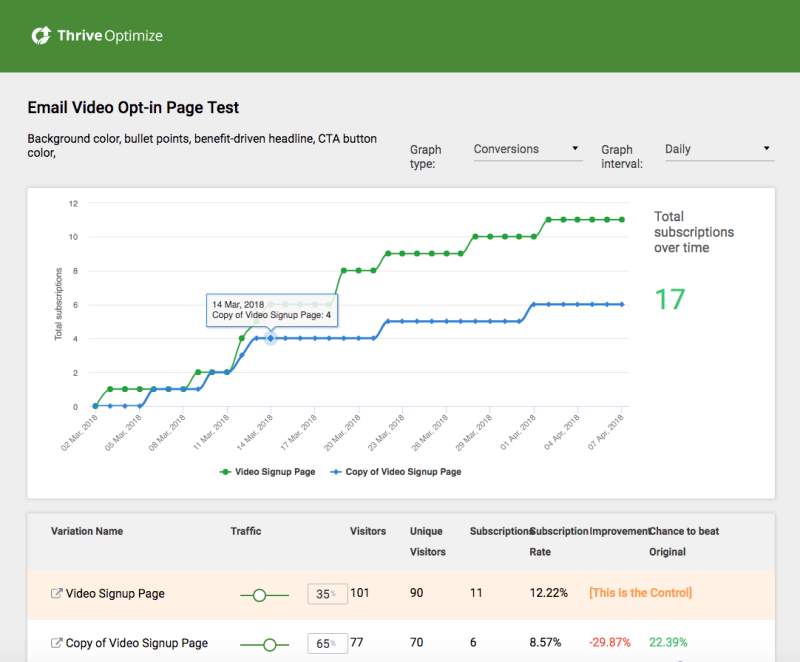 Create tests to measure page visits, subscription rate, revenue conversions. Automatic winner feature, meaning you can set this thing to work on autopilot. How do you use Thrive Optimize? So, how do you use Thrive Optimize exactly? 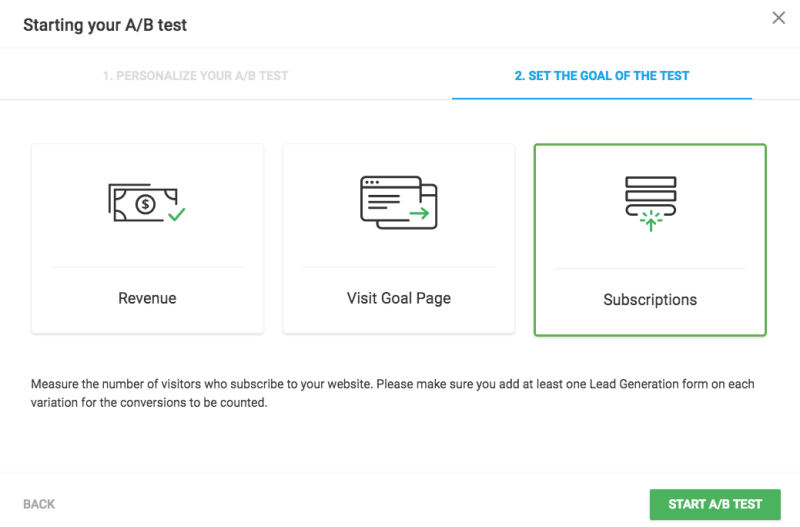 Well, in the short video below, I show you how I used Thrive Optimize to set up conversion rate A/B split testing for my lead generation page I talked about above. Is this plugin right for you? Are you currently using Thrive Architect? If you are, then it makes sense to get this plugin. Are you happy with your current conversions, or do you want to be able to test your pages to see how much better you can improve it? Do you want to save time, money, and resources? I’m very well aware that this plugin isn’t for everyone. And one of the reasons is that Thrive Optimize is not a stand-alone plugin. But in the long run, the positives outweigh any negatives here. You get access to groundbreaking tools that could help your business grow quickly, and you could be saving yourself a small fortune by not having to pay a monthly subscription fee to use tools like CrazyEgg or HotJar to help you do simple A/B split testing, or, having to pay a web designer to build custom landing pages for you. So, let’s dive into some of the likes and dislikes of using Thrive Optimize. No need to add scripts to your website or pages. Huge time saver, everything takes place in your WP dashboard. Works with Thrive Architect, the powerful drag-and-drop landing page builder plugin. Create your first A/B split test within just a few minutes. No monthly fees to tie you over like other A/B testing tools. Great support team behind the product. Not a stand-alone plugin, must have Thrive Architect plugin for it to work. 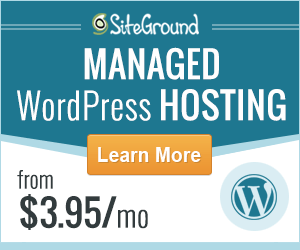 Will not work if your WordPress blog or site is hosted on WordPress.com Only works with self-hosted WP sites. How much does Thrive Optimize cost? Once again, if you already have the Thrive Architect plugin then you don’t need to buy it again. Avoid the bundle (Thrive Architect + Optimize) at any cost, just buy the ‘Optimize’ plugin on its own. If, on the other hand, you are completely new to both Thrive Optimize and Thrive Architect, then you can purchase these two as a bundle, which will set you back the following discounted price. Click here if you would like to check out my Thrive Architect review and video tutorial. So, there you have it. I have tried to be as honest as I can with this Thrive Optimize review. And, if you’ve been following my blog for some time, then you’ll know that I never review or recommend a tool or service that I’ve not used in my business. I’ve used Thrive Themes tools to grow my online business since 2014 and it works for me. I’m confident that by seeing how I’m using these tools in my business, you can hopefully visualize yourself using them too, to help you reach your online business goals. So, I’ll let you decide for yourself whether you think Thrive Optimize and Architect is worth your time and investment. Personally, I would recommend them anyone serious about growing their business online. If you’re already using this plugin, I’d love to hear your feedback on how it’s working out for you. Leave your comment below as always. Watch out for updates on this post! As I mentioned in the post, I plan to create a few more tests using Thrive Optimize. I will also be creating a few more videos to document my failures and successes using this tool, so keep an eye out, or subscribe here for updates! Affiliate Disclaimer: This post contains affiliate links/buttons to Thrive products which I use in my business and therefore recommend to you. This means if you click on an affiliate link and make a purchase of a product or service, I may earn a small commission, at no additional cost to you. Thank you for your continued support. I look forward to your next review. Hey Enstine, how are you? Great to see you here mate. I’m glad to hear you’re using and loving Thrive Themes products. Thrive are a true game changer and I’m so thankful for everything they have done over the recent years.